Wealthy men are starting to vanish from a resort in Jackson Hole—which is exactly where Nikki’s runaway teen seems to be as well. Something nefarious is going on at the luxury spa, but what? The last thing Michael needs is a confrontation with Nikki—especially when his control over his bloodlust is still so tenuous. But posing as a newlywed couple at the swanky resort may be the best way for both of them to solve their respective cases. This time, Nikki is determined to make Michael see that life apart is worse than death. Yet before she can make him see the light, a specter from Michael’s past rises that could destroy any hope she has of a future with him. Because this time the threat isn’t physical. It’s a matter of the heart. I was not crazy about book one in this series, DANCING WITH THE DEVIL, but because I have enjoyed Keri Arthur’s Riley Jensen series I wanted to take another look at a book in this series. And, yes, this book appealed to me more than the first. The romance is stronger, it is not quite as dark and yet it has loads of action. There are multiple other worldly characters with special attributes from vampires, witches, Imps to clairvoyant Nikki. The world these creatures populate is our world although that felt vague to me. 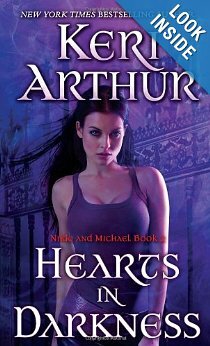 This series remains not a favorite of mine although this book is much improved over the first in the series. 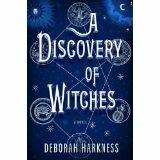 In Harkness’s lively debut, witches, vampires, and demons outnumber humans at Oxford’s Bodleian Library, where witch and Yale historian Diana Bishop discovers an enchanted manuscript, attracting the attention of 1,500-year-old vampire Matthew Clairmont. The orphaned daughter of two powerful witches, Bishop prefers intellect, but relies on magic when her discovery of a palimpsest documenting the origin of supernatural species releases an assortment of undead who threaten, stalk, and harass her. Against all occult social propriety, Bishop turns for protection to tall, dark, bloodsucking man-about-town Clairmont. Their research raises questions of evolution and extinction among the living dead, and their romance awakens centuries-old enmities. Harkness imagines a crowded universe where normal and paranormal creatures observe a tenuous peace. “Magic is desire made real,” Bishop says after both her desire and magical prowess exceed her expectations. If a book doesn’t grab me by page 100 then I usually just set it aside. 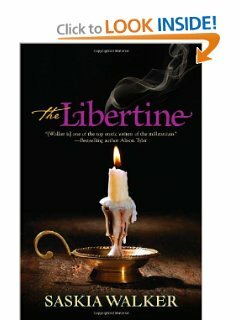 This book was recommended by a friend and I thought in deference to her I would continue on. I should have just trusted my first gut instinct. Although the premise is an interesting one, the book never got off the ground and toward the end it kind of stagnated even more. The author threw in more characters at the end and they really added nothing to the plot, I kept waiting for an explanation. The romance was not hot, it barely simmered. At least a hot make out session was in order. I have so many questions about the ending that I’m sure will be alluded to, even if not answered, in the next book. On the plus side; the author obviously researched places such as Oxford University and the hierarchy of that institution, the living areas and the library. All of which I found interesting. I also enjoyed the fantasy of the witches’ house. It was another character in the story.